Z.Vex's Instant Lo-Fi Junky is now more pedalboard-friendly. 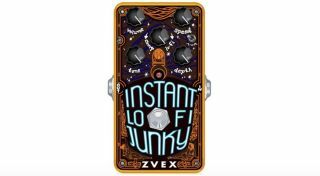 Z. Vex has announced a Vertical version of its Instant Lo-Fi Junky pedal. This new version of the pedal is identical in every way to the original, but in a more pedalboard-friendly size. The pedal still features a lo-fidelity, warbly chorus/vibrato tone, in addition to volume, tone, depth, speed, comp/lo-fi and wave shape controls. The Z.Vex Vertical Instant Lo-Fi Junky will be available starting March 29. No price for the pedal has been made available as of yet. For more info, head on over to zvex.com.